I heard from my Mother during my childhood days and even today she tells me that a few wishes come true instantly and some play hide and seek for a long time! Probably, God’s own way of telling that right things happen at the right time and you need to simply keep at ‘em…. Unearthing beauty of Serengeti plains has been a hide and seek game for way too long with me, just like a few of those wishes that keep you at your toes like a hidden treasure and needs a bit of love from my lady luck! Year after year, my tryst with such an iconic place, has only made me realize where my heart and soul lies! It is an annual pilgrimage that I look forward to with bated breath and sadly it gets over in a split second. But, I don’t give up as yet! I keep visiting her and intend to do so, every year, perhaps until such time one of us ceases to exist! I do hope, let me be the fallen one. With such a thought I embarked upon my third consecutive journey to the plains of Serengeti. I smiled to myself when I was asked to board the aircraft .. the first time someone had to do this while I was lost in my day-dreaming world! I apologized profusely for being so ignorant of time, before my long journey began. ‘Ladies and Gents, to your left is Mount Kilimanjaro’ – I woke up to the Captain’s announcement. How it filled my heart with joy! It was 3:00 pm, 8th Feb 2018, over-cast and I saw dark clouds hovering around the mountain as though they had decided not to part ways. All first-timers went on clicking, photo-bombing one another but well, that’s the excitement this place brings. The entire evening was well spent in relaxing and a good night sleep was in the order! Woke up to a fresh blended Tanzanian Coffee and wheat porridge the Chef prepared exclusively for me! I took a quick walk in the hotel property of Airport Planet Lodge. A beautiful lodge that is very close to the Airport. They do lot of organic farming and lot of birds to be seen. Lot of Banana Plantation, vegetable farming and neatly maintained. It was still time for me to depart from here so, hung around with another cup of freshly blended Coffee! Mild sun, in middle of garden.. all by myself... ; My Airport pick up was ready - thanked the staff and off for more! What a way to start a day! And then... A flight to catch up that would take me into the plains! 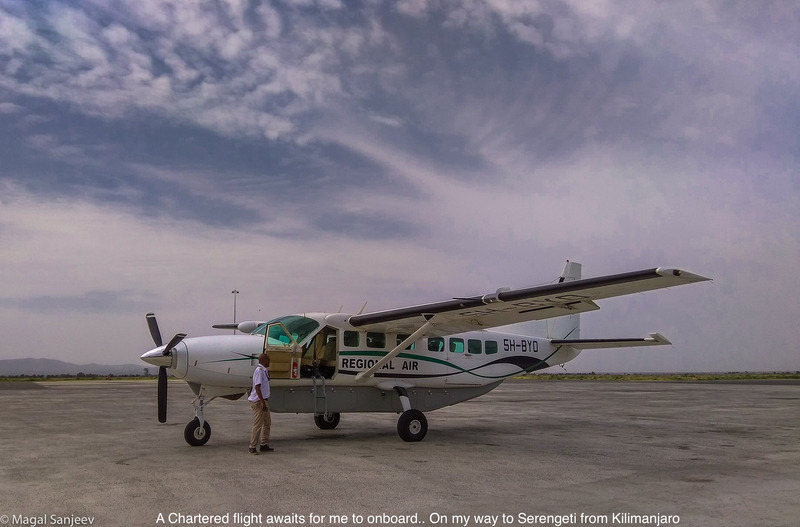 Hopped on to a chartered flight and my journey began as we glided on top of Ngorongoro Crater before descending into Ndutu – Southern Part of Serengeti! The screeching sound of landing impact on a muddy tarmac announced our arrival! Here I come! It was Deja-vu. I was so sure that I have been here before. The warm and dusty air was familiar. I looked around to see the typical acacias, starlings, Kestrels - flying all over. The next 4 days, I would roam around these endless plains, is what I told myself. Plains that house the running machines, a.k.a. Cheetah, Acacias that hide the rosetted beauties, a.k.a. Leopards and of course the king of the Jungle. The last two times I witnessed a courting pair of lions and to my utter disbelief, even this time, I was lucky to witness a young couple romancing in the wilderness! Year after year, I have been lucky to have been watching moments unfolding. This was the beginning of the end of the summer and yes, it was hot, dusty, dry and I could see thousands and thousands of Wildebeasts in a single column making their journey even as they gave birth to young ones. A spectacular journey that I have been witnessing year after year - raw yet magical! Accompanied were the painted beauties-Zebras that gave an absolute mix to the endless horizon! Young ones, standing on their own, minutes after being born and running alongside their mothers – It was divine! Even as the wicked Hyenas, one of the powerful predators, kept a close look for a meal, the fight for existence was truly evident, conveying the story of life! Circle of Life. .
Thousands and thousands of Wildebeest and Zebra run through the plains. Dramatic mornings that you can just never fail getting used to! How does one define the color palette oozing out in the skies – Vibrant and vide hues painting the sky with the first rays of the sun, kissing the plains, lighting up the savannah. A lone Giraffe trudges along the water-hole, setting up a beautiful silhouette and just imagine a Cheetah walking past with Lemagrut Mountains (Northern side of Ngorongoro Crater) as a backdrop – I’d rather die right here and do anything to be a part of this heaven than hoping to be part of an unseen one! One of the emotional moments I came across was a just-in-time born Wildebeest Calf being lost in middle of the plains. It walked and rested right next to my Jeep and mistook us as its mother or protector! My heart went out to this just born calf as he followed us where-ever we drove, it wouldn’t leave us. We stopped and it stopped! We moved and it moved! I even tried pointing him to the direction of the wildebeest herd but no luck! Finally, we drove right into a huge congregation of wildebeest, promptly, this calf followed and in the end, disappeared in middle of its native herd! Phew! He's back with his clan. All is well that ends well! The setting sun poured endless streaks of orange, yellow, pink all over the inhabitants, including me! 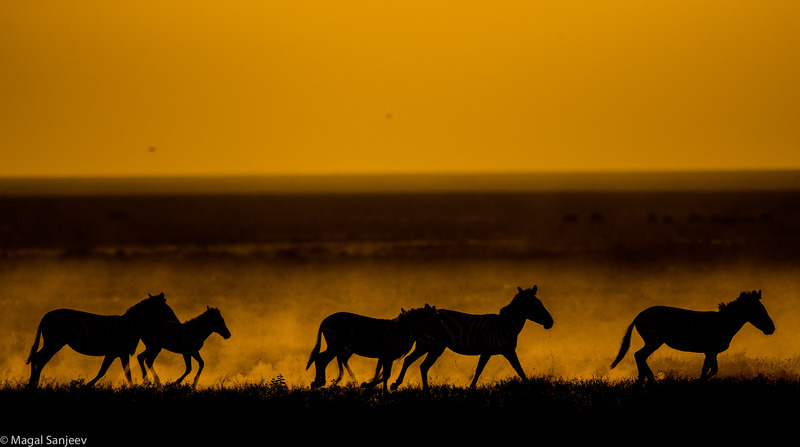 A long road, dust kicking all over, Zebras running to call it a day...endless plains, far across few acacias trees and the setting sun melting somewhere across the horizon – I lose myself here yet find my true being. Time that stands still! It gives loads of meaning to my existence. Emotions that I can’t explain. Well, with such overdose of emotions making me feast on some home-made food that night, I looked ahead as I’d move into the Central Part of Serengeti the next morning. My Quest begins! My search for Moru Kopje Pride begins!Every year, I doze off during this journey either because of a notion of a long or a dusty ride or may be because of this stretch or just me being awfully tired! I have had my share of siestas. The afternoon shadows started hitting the plains and one of the early signs of getting into the Central Serengeti is Stinger Missiles – a.k.a. Tse Tse Flies :) Its guaranteed that you will be woken up or these flies acts as an alarm call that you are in the zone! The sharp sun was hitting me through the window and my eyes just couldn’t take it! I was so tired and could barely lift my camera when I heard – Lioness! I opened my eyes to see a Kopje while my eyes searched hard to spot this cat. In the end I gave up but just then a cute fur-ball ran down on a small hillock that got me excited! This signaled me that we were in Central Serengeti! Thanks to MTR Ready to Eat Recipes and some home-made delicacies, as usual, I feasted on my traditional in-take while anxiously waited for the first rays to heat me up. And for sure they did! A sea of Orange and Yellow, never ending pink and maroon patterns of clouds marooning the Acacias and the plains, Few Balloons floating, some of the Kopjes shining in middle of nowhere, the thin but moist air making me shake like a leaf, I looked around, isn’t it heaven? Yes, this is my paradise. The sun rise in Serengeti! An absolute spectacle. Light painting me in gold. Light painting the Savannah in yellow and orange or I just don’t know how to name that color! What is making me come to this place, again and again!? Guess the sheer emotions the nature plays here, the exorbitant metamorphosis of day and night, light and dark or perhaps, I just don’t know how to describe it best because words just don't do any justice. As the yellow grass dances to the tune of early morning breeze, as the early comers of the migrated Wildebeest look around, the blades of the elephant grass open up only to let us see a stray lioness drinking water from a nearby gully. Few Superb Starlings glides across and the inimitable kestrels wade through the early morning mist – If I were to call something home, I’d better call this as my home! A Typical sun-rise in Serengeti! The sun was blazing away. It was as if, with a vengeance. On top of it, the dust created by the heavy wind made me feel as though I am in middle of a dust bowl. It was so intense, I could see mirages and interestingly my camera couldn’t get a decent focus owing to the heat waves. And walked-in this Cheetah Trio (Mother and two adolescent cubs) in no-time made three hunts, two being successful, made me go numb! The theory is during these conditions Lions and Leopards will be sleeping or be under the shade, barely able to move while these machines can quickly help themselves with a meal. I watched all these proceedings with my naked eye and shortly after that, on the left side of mine, there was chaos! Absolute chaos! Herds of Zebra and Wildebeest looked alert and apprehensive – Rightfully so! In such a scorching heat, these three lions walked slowly to the water hole and dumped themselves into it! Hundred meters away, there was another waterhole that was swamped with Zebras that walked in for a drink but was so scared, looking at the lions, gulping few drops and if one of Zebras felt threatened and jumped, the entire herd, ran helter-skelter creating a cloud of dust before assembling back by taking turns! 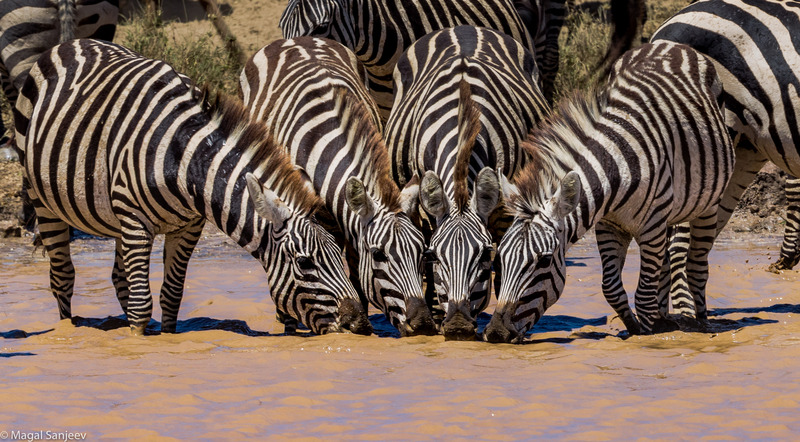 In such a situation, I saw an opportunity where these four zebras walked in together, let go off the guard and helped themselves a drink! Second turned to minutes, minutes turned an hour. everything was so silent and there was no movement around. Scanning through the golden grass, it was the most painful wait that led the afternoon sun turn golden-yellow. Finally, the tail’s up! The golden lit evening sun welcomed this queen of Serengeti. As she stood up, mildly, wading through the tall blades of grass, she was lit up in gold! She looked around, across the plains even as the mountains stood still as though they were waiting for her to walk by! She sashayed around and came out in the open only to make me squeak – She has a cub! The next 30 odd minutes was one of the best times in my life! While I was enjoying watching the mom and cub, she was cautious and ensured she gave enough space for a spotted hyena that was lurking around. After the Hyena disappeared into the bushes, this bold cub, walked head-on, as though letting her mother know that, she has arrived! Indeed, she arrived! I was grinning ear to ear, and the smile was filling my heart! My eyes were twinkling with stars. What an evening it was! My heart was filled with joy as my jeep cut through the darkness heading back to the camp. 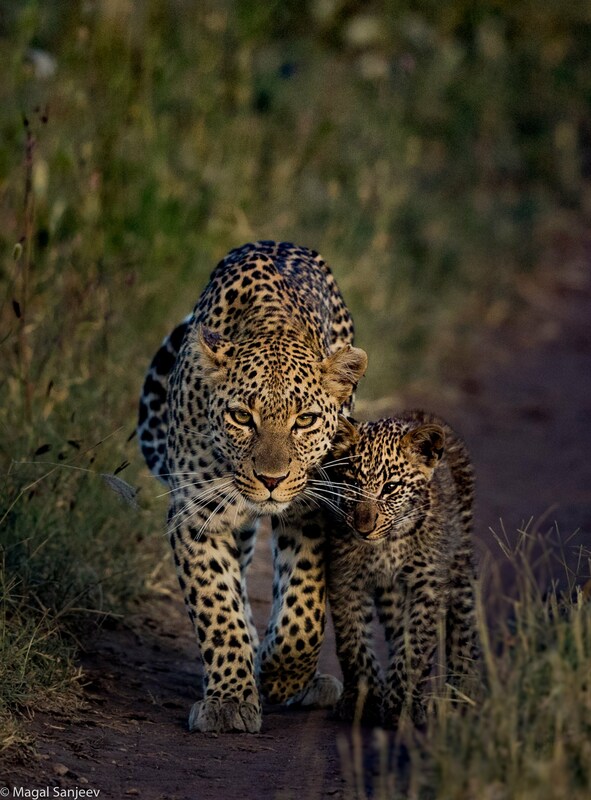 Mother Leopard with her Joy! There are dreams, hopes and wishes. All are different yet, it’s all part of me. This is my third year and I have been hoping to see a lion pride on a Kopje! My dream is still on! Every time, I scanned a Kopje, I was hoping to see a Lion! I was hoping to see a pride! All through the next few days, I moved around these Kopjes, waited patiently but in vain! I closed my eyes only to visualize, only to think of a pride standing on a large Kopje…. I moved closer to one of the bushes that was adjacent to few rocks – high on anticipation. Nothing happened. 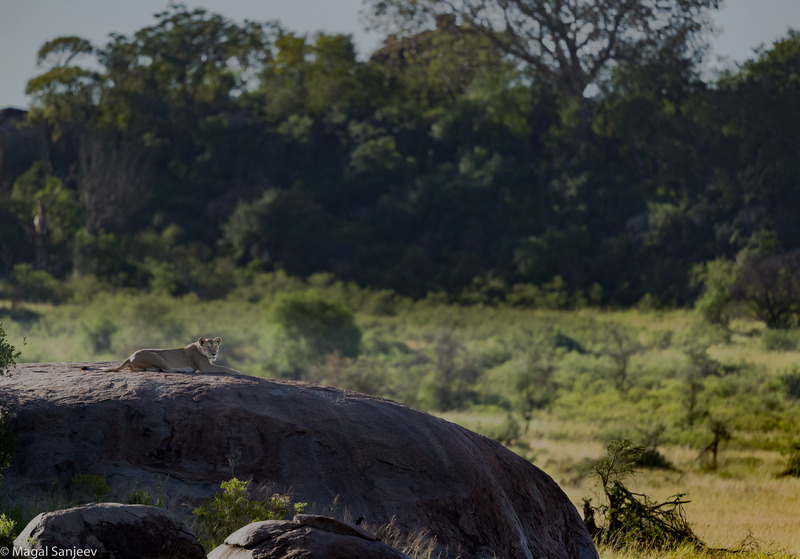 There are so many Kopjes around, all around and I was telling myself – why can’t there be at-least one lion out there? Am I that unlucky? Am I not that fortunate? I keep telling this myself year after year and yet, nothing seem to happen. All my excitement died down; All my anticipation faded. I kept asking the same set of questions to my naturalist – why aren’t we lucky? Are we in the right zone to spot? Do we have to go to a different part of the plains? Well…. I know the answer but my emotions always get the better of me when it comes to this dream! An unfulfilled one! My hunger had died down long back so was my excitement. At one point in time, I decided not to lift my camera. I pretended to fall asleep. I pretended to be happy. I pretended to ignore my dream. God! Am I asking too much? Am I the unlucky one? I do feel the best is yet to come when I come back next year – That was the best answer I could give myself. Perhaps it’s not my time! Or is it just too early for me to fulfill my dream? For my quest ? Guess so. 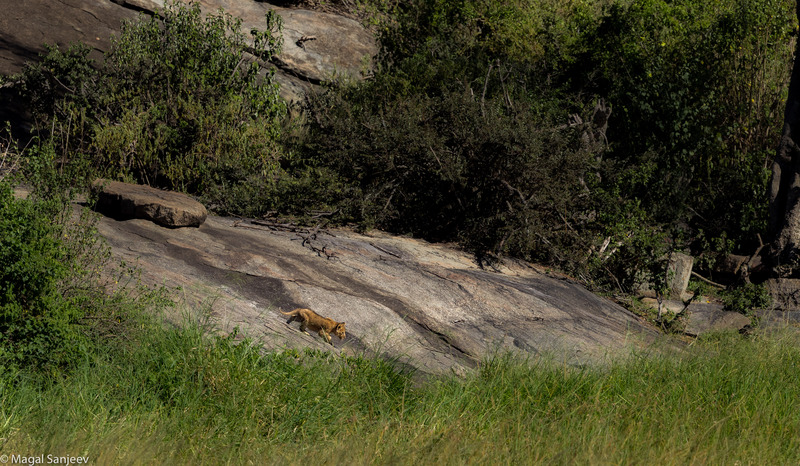 It was much later when Hassan (my naturalist /guide/friend) said, Lioness on a Kopje! I hoped he said a Male Lion (with due respect to the Lioness, of-course) but to my bad luck, the setting was so profusely bad, the light was harsh, she was sitting way too far and was sleeping! Guess that was a mild hit to my ego even as I watched her, captured few moments but still… where is my lion standing on a kopje, with a picture perfect background? … Some dreams do remain unfulfilled… some wishes stay unanswered but I do hope at some point in time, my quest for Moru Kopje Pride is fulfilled. I am living for that day, for that point in time in this life! With loads of emotions, I flew out from Kilimanjaro, before biding good-bye to few good friends out there. As my chartered flight glided over the savannah, I saw few Kopjes that looked so small…but much bigger than my heart, lot bigger than my soul…. so beautiful and divine…and I told myself and my damaged and bleeding heart, that next year I come back .. once again in Quest for Moru Kopje Pride. I closed my eyes to catch few winks…only to wake up… when the Captain announced our arrival in Bangalore…. My sincere thanks to Hassan Swalehi who has been my Naturalist/Guide during all these years. He has always been patient to my laundry lists of asks, positioning of vehicle, Innumerable head-ons of Lions and Leopards. What lies in the darkness?